RompHim transforms women's garment into men's summerware. Every year, without fail, a faintly amusing gamble in fashion hits its inflection point and touches off a conversation that winds up striking more of a nerve than anticipated. We saw athleisure go mainstream in the afterglow of normcore and now nobody blinks at designer sweats with nifty zippers. This time, we're in for a ride that could prove to be a summer sensation among young men who want to "turn heads and break hearts," as the creators of RompHim so preciously put it. Savvy business school students at Northwestern University have created a male version of the one-piece romper traditionally worn by women during the balmy months of the year. The Kickstarter for their product has already collected more than $80,000 and doesn't show any signs of slowing down. "We think this is a way for guys to have a new option in their wardrobe, to have fun, to feel unique, and take it wherever it goes," Elaine Chen, one of the company's four co-founders, told GQ. "If they're comfortable with themselves in it then we think that's great." From a male standpoint, the main perk here is that a front zipper permits the option to pee without taking the romper off — a drawback women have noted in their experience with this style of garment. Most observers are classifying the RompHim, which comes in various sizes and designs, as an item best suited for bros at parties, festivals and other large public events. In other words, it's the sort of thing worn by those who want their contrived revelry to be so disdainfully ignored that the act of doing so commands full attention. It should be no surprise that Twitter's reaction to RompHim has been all over the place. This thing isn't even out there yet and the reactions have all the markings of a widening battle over its gender messaging. No #rompers for this guy! I like my cargo shorts, black t's, a hat and Vans. I been sporting this look since the early 90's. Woot! Y'all be hating but man #rompers makes the most sense because they can still pee without getting full-on naked. 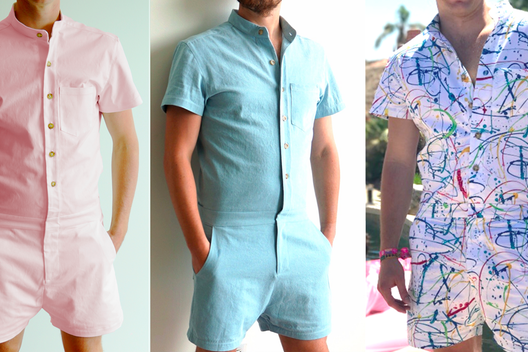 #Rompers for men just prove my point that clothing designers are trying to turn men into women. First the long tees, and now this atrocity. Are these male #rompers business casual? Asking for a friend. Why tf are we calling #rompers for men "romphims" instead of "brompers"? Keep your eyes peeled this summer, but don't even bother judging. It's pointless.